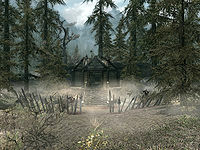 Witchmist Grove is a small shack north of Bonestrewn Crest and south of Kynesgrove. The easiest way to reach the grove is to travel to Kynesgrove and head due south from there. It is a small grove of trees with a doorless shack surrounded by sharpened stakes in the center. There are other typical hagraven markings around the area. A short distance to the north is a leveled animal. Prior to starting the related quest a generic witch or hag resides here. Once you initiate the quest it is changed to a hagraven named Moira. Inside the shack is a single bed and two barrels; one contains ingredients and the other foodstuffs. The shack is in total disarray, with numerous human and animal bones, goat and skeever heads and antlers strewn across the floor. The whole shack is covered in blood splatters, although the bed is still usable. There is a copy of the Destruction skill book Response to Bero's Speech on the floor beside the bed, and a total of seven hagraven feathers. Outside and underneath the wooden stairs leading up to the entrance is an unlocked wooden chest containing minor loot. There are several dragon's tongue flowers, creep clusters and patches of jazbay grapes in the vicinity. It seems to respawn automatically when initiating the related quest, even if that is less than the stated 10 day respawn time. 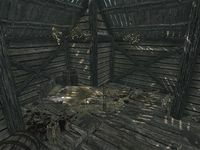 Some of the hagraven feathers may clip through the floor, ending up on the ground underneath the shack. This page was last modified on 9 April 2018, at 16:22.